Economists often do a crummy job of teaching people about the impact of fiscal policy on the labor force, largely because we put people to sleep with boring discussions about “labor supply” decisions (my blog post from last year perhaps being an example of this tendency). From now on, I will try to remember to use this cartoon. It’s a parody of Obama’s policies, but the last slide (or is it a panel?) is a great teaching tool about what happens when politicians turn the safety net into a hammock. didn’t the original cartoon have the king giving this speech? I was trying to find the original one. When people don’t have any faith in their leaders, their spirit sags because their IS no leadership. People go their own way, they feel deserted, lied to or realize that their so-called leaders aren’;t worth listening to anymore. Anybody have any ideas worth following up on?- solo or together? on March 4, 2013 at 4:04 am Question of the Week: Who Is Your Favorite Political Cartoonist? What do we need *jobs* for?!?!? @pennywise: Fish don’t know that water is wet. People who live with socialism don’t know that it is socialism. What if you took the peasant’s question seriously. What *do* we need jobs for? It’s missing the panel where the servant calls the guy in the crowd a racist. Because the only reason we want to work is to cover our basic needs. Give us a shed, a burlap sack, a wheel of cheese, and some band-aids and we’re all good. It’s not a parody of Obama. 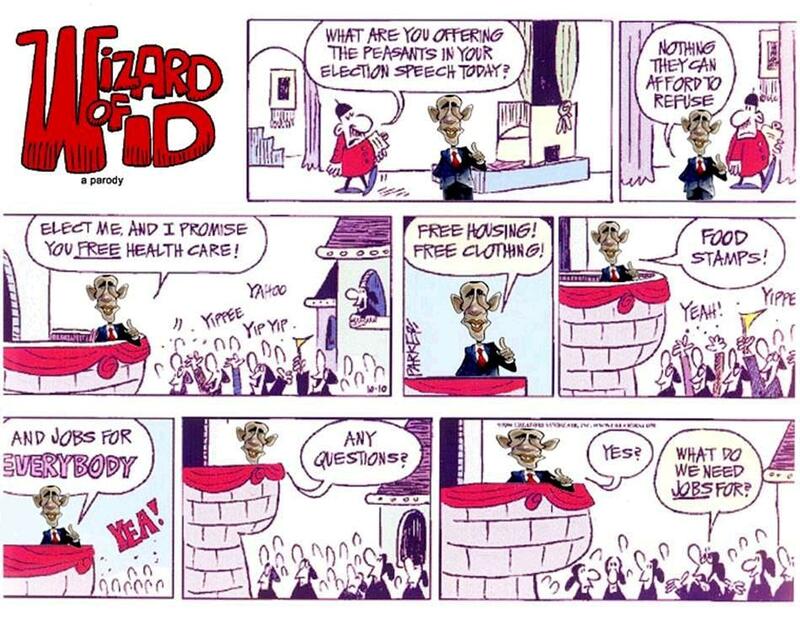 Someone’s photoshopped an Obama cartoon into the strip. pennywise: Not necessarily red, but certainly pink and on the way. Weird people, this american. They confused a public service well known outside their country frontiers with socialism or even communism. I ever wonder if they trully known what is communism actually. In fact, Im sure that now they thing Im red. The funniest things always contain elements of truth… Awesome!